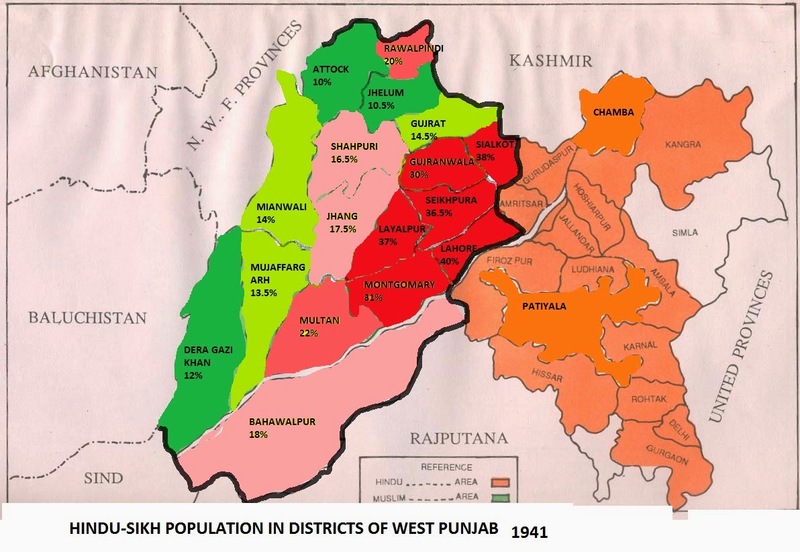 In this blog, I have discussed about disputed areas of United India which were given to Pakistan during partition of India in 1947. There were five such areas of dispute, Sindh and Lahore on west which are now in Pakistan, Chitgaon and Khulna in east (which is now Bangladesh and it was eastern part of Pakistan before 1947), other disputed areas is Jammu and Kashmir. In total Congress gave away 90,000 square kms of Land settled by non-muslim majority population was given to Pakistan during partition, equivalent to size of Bihar. My point is if Assam was partitioned and muslim majority syllhat district was given to Pakistan, why Chitgaong, Tharparkar, Amarkot, Mirpur Khas were not given to India? 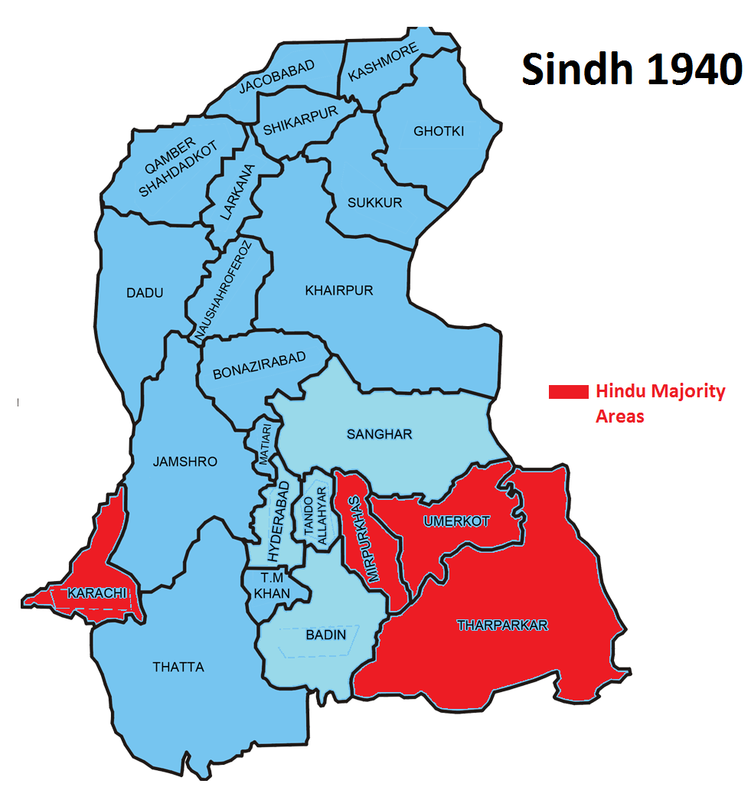 There were a total of 6 districts of Sindh which had complete Hindu majority until 1947(Areas shown in map). These are Tharparkar, Badin, Hyderabad, Sanghar, Mirpur Khas and Amarkot. Hindus of Sindh owned 40% of land, pre-partition and were 33% of population of province which has a size of 141,000 sqKms. 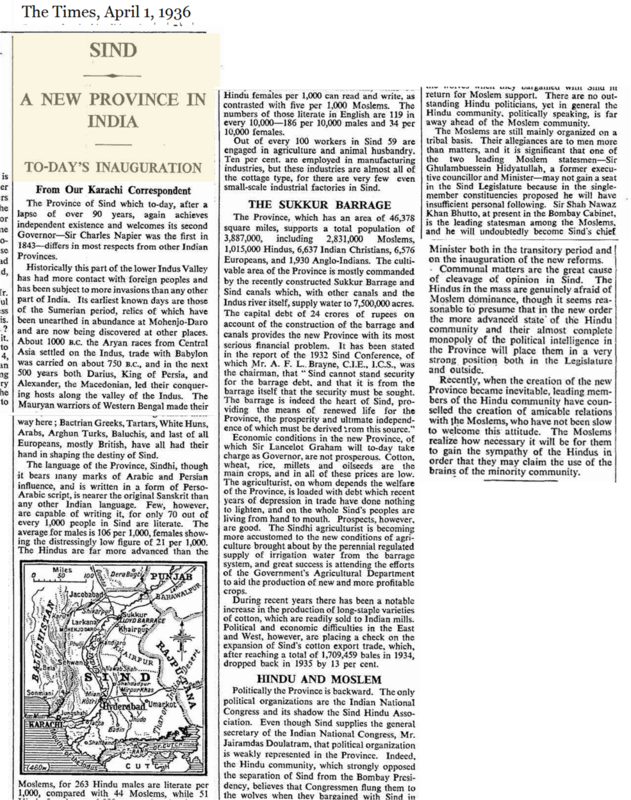 Separation of Sindh from Bombay province in 1935, under pressure from Muslim League, itself was an act meant to decimate Hindus from western part of United India. Congress and Nehru had no objections as they were in hurry to get power. City of Karanchi had 47.5% Hindu population pre-partition. After creation of Sindh province, Sindh govt decided to return land owned by muslims before 1907, which Hindus had bought owning to their own effort and economic success. Hindu merchants had a feeling of their fate after partition. After partition 800 Sikhs were killed in Karanchi alone on 6th January 1948. Half of the sindhi Hindus and sikhs migrated to India. Today Hindus are 8.5 % population of Sindh. If justice was to be done to Hindus, then Sindh should have been partitioned like Bengal, Assam, or Punjab with Eastern Hindu Majority part becoming Indian Sindh. Hindus of Sindh almost live as third class citizens, because of our faults. Times of India 1936, it says how Congress separated Sindh from Bombay to gain support of Muslims before elections. But Muslims did not support congress. It seems more of a hypocrisy of congress leaders which made them always eager to gift India to Muslims in order to beg certificate of secularism from Muslims. 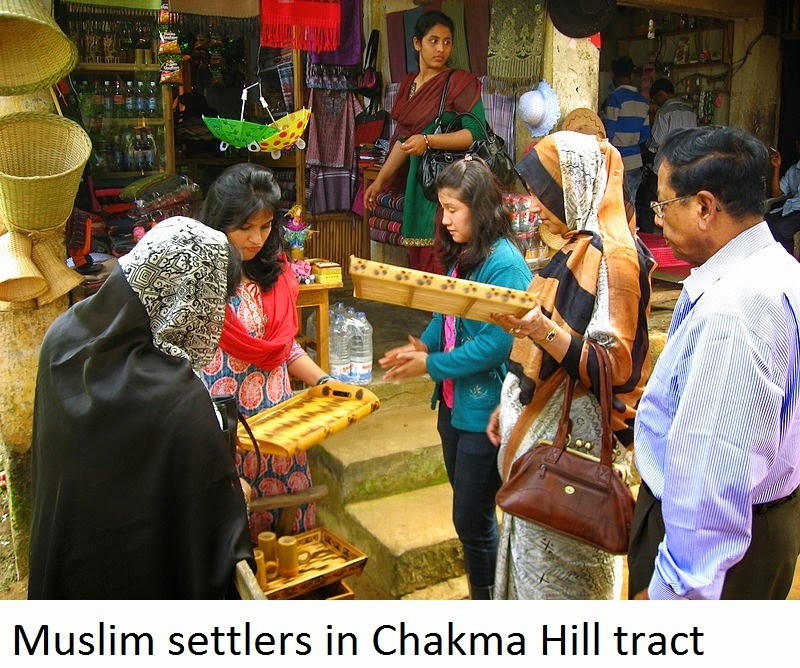 The Cittagong Hill Tracts( 13295 sqkms) had a tribal population of 97.5% at the time of partition when it was supposed to be included in India. But Pakistan Army occupied the hill tracts on August 20, 1947. On 15 August 1947, many of the tribes did not know to which side of the border they belonged. On 17 August, the publication of the Radcliffe Award put the CHTs in Pakistan.Two days later, the CHTPA (Chittagong Hill Tracts People's Association) resolved not to abide by the award and hoisted the Indian flag. The Pakistani army dealt with the protest by killing several Chakma. Despite repressions during the Pakistani rule, the Chakma tribals managed to survive, but after the out-break of insurgency by Shanti Vahini in mid-70s, the then president Zia-Ur Rahman started settling Muslims from the plains into Chitgaon. By 2001 tribal population had gone down to 55%. Chakma Buddhists are still fleeing to India and Myanmar. Bangladesh govt provides free ration and financial aid to settled Muslims. Tribal land is being forcibly grabbed with legal aids provided by Govt, atrocities are being committed on Chakmas daily. As recent as 3rd August 2013, muslim settlers attacked Chakma villages, murdering 6, injuring 50 and setting ablaze dozens of villages, 500 houses. 2000 people fled to Tripura on Indian side. Attack on Chakmas was justified by local media on grounds that Chakma abducted one muslim, but that was staged drama to as accepted by Assistant police superintendent of Ramgarh Circle. Indian media and western media have shunned the news about atrocities on Chakma, always. Same media and Human rights makes hue and cry when Rohangias are attacked in Myanmar (for their own reasons), Rohangias are originally Bangladeshi muslims. Chitagong port was single access of north east to sea, It would have been very easily connected to Port of Kolkata through sea route. North east lost its chance to connectivity, prosperity and security. Khulna Division is on the other side of border, adjacent to Kolkata. At time of independence, Khulna divison comprised of several of Bangladesh districts. Hindu constituted 52% of population of Khulna at time of partition. In total about 35,000 square Kms area went to Bangladesh including Chitgaong Hill tract and Khulna. India only got small muslim majority Murshidabad with 5000 sq Kms and Kishanganj (Bihar) 1900 sq Kms, in lieu. Congress did not put any resistance. Lahore city itself had Hindu-Sikh majority. But Muslim League, Unionist Party with tacit support of Congress were successful in changing demography of Lahore year after year since 1930, with inclusion of Muslim majority villages from west into Lahore municipality, pre-planned settling of Muslim villagers. Muslim league and Unionist encouraged Muslims to register their numbers more than actual numbers, number of muslims were exaggerated to get Lahore. Hindus owned 80% of wealth of Lahore, their efforts of centuries, Colleges, Banks, Industry everything was lost in a single stroke of fate at hands of pseudo-secularist Congress party. A point must be added to Jammu and Kashmir being considered Muslim majority. In fact Kashmir is only 15% of J&K, so 85% area have Hindu Buddhist majority. So any dispute must be considered on 15% area Valley only not on entire Jammu and Kashmir. Very good analysis. It is in sync with my views on two points. 1) Sindh should have been partitioned with some portion of Indus river in the Indian SindhuDesh. Wonder why the stupid Nehru was not bothered about it. 2) If Chittagong was kept with India, we could have had a seaport access to North eastern states and thus there would have been far better economic development there and far better integration with Bharat. Today, we see too much of our Army needs to be posted there for counter insurgency operations. Another of Nehru created mess. Jai Hind. You should check the Chittagong map again. Only the Hill Tracts are Buddhist majority. The port is Muslim majority. So India still wouldn't have gotten the Sea access. Only three extra districts in the hills. Sea would have been 30 - 40 km from land , the extra passage from Burma could have been procured by some concessions . Your blog's name is my endeavor with truth, but it is full of lies. Karachi Hindu population was 51% in 1941. But the So called Indian Muslims(1945) Voted in Blocks to Create Pakistan and Leave! All pakistani give demographic data of 1947 where from they taken when country was in turmoil. All data of 1941 proving them wrong. yes, already your brothers killed and chased out all himdus from Kashmir. And why dont you open up and say your forefathers and u support Pakistan? Haram ki auladen, voted for Pakistan, remained in India and now silently support Pakistan. in India d said survey had not much of a need.minority in pakistan have reduced frm 10% to 1% today... those minorities have been converted or killed. But in India muslims have doubled. Pakistan have allowed the growth of selected section even in the Muslim world... can u have bhora muslims or ahmadiya muslims survive with that honour which they get in India... india is the only country in this world which houses every kind of muslim.. in India there are conflicts bet Hindus and muslims... but only against radical muslims... who believe that every non Muslim is a kafir and must be killed..the fight is for survival for Hindus and for radical muslims it's about religious practices even if it is at the cost of human lives... a major of muslims are good... but they can't voice themselves against the few radicals who in the name of religion are creating hell... it's scary that this may incite fire amongst religious group of hindu. but strong leaders like modi know how to save this country wit survival of all Indians irrespective of their religion... lastly 1 question... where did these muslims come from in pakistan they never came from Arab land... few like those in kerala accepted Islam by choice... but a major were converted at gunpoint or by fear... they can check their full names abs get their history... those muslims who have hindu surnames like chaudhary bhat desai Patel munshi khatri Ahuja basu.... these names are not found in the Arab world... they were hindu convert .every different religion is just a different road reaching the same god who is identified with different names.... let me give a little knowledge about some hindu facts ... 1. Hindu religion after death a person is burned... but no one knows that centuries back system was different.. after death common man was burnt but a sadhu or religious leader who had been living in jungles or mountain tops in meditation were either buried or inbred immersed in water... all ways are permitted ... hindu belive that the body has soul and till the time the entire body does not decompose the soul does not leave the body hence those ppl too attracted in material world were burned for fast riddance of body but small child upto 1yr or sadhu sant are buried as they belive that natural source of tree should not be wasted to burn the body and the soul is already attached to God so no worries if the body decay takes long.... 2.last complication.. when ppl say why Hindus have so many gods and so many books which is reliable.... well in Hinduism it is believed tat you can experience god the way you desire... example... you are a husband to your wife but a son to your father but a father to your son and a boss to your staff at work...its the same you but different ppl observe you in different way... exactly like that... if you meet a real hindu saint living in jungle or mountain tops he worships like the muslims in a formless god but the priest in the temple worship him in a stone in which he imagines his god and by belief and faith he experiences god.. those who worship god in different forms worship his different incarnations... there is no book written by god but his followers and big saints have either written down life of incarnations of God or what they said in human form was noted like in bhagwad gita... cuz every word of God or his ways of life is what our conscious accepts... hindu strongly belive that just a little grooming is required for the soul which later develops such a strong conscious that the soul avd conscious itself decides the right and wrong... and about God... the relation is simple ... don't fear god... love God and when you get loved back by him you have experience god... the love which you get from him has no specific signs... it will come back as good deeds or love in some way which only you can feel... just the way a mother loves her new born .. no words just experience.. I am a Bengali and basically of Kolkata-Khulna origin and I agree with this analysis because I heard the same from my grandmother. For her it was like home away from home,but sadly it was partitioned. Khulna was part of West Bengal in 1905 Lord Curson's division of Bengal and you can add this as well. thanks for response. I will try to put that map of 1905 as well. Nadiya Dist.of Bengal Partioned snd Muslim Areas of this Dist.gone to Pakistan as Dist.of Kushtiya.Same as Dinajpur Dist.Most of Dinajpur gone to Pakistan except Hindu Areas of Balurghat and Raiganj Subdivision.Same with Malda.Malda Muslim Areas merged with Rajshahi Dist.and gone to Pakistan.Yes only Murshidabad was Muslim Majority.Muslims are growing there in st ease Position but Hindu Dalit Majority Khulna was gone totally in Pakistan due to thatfoolish Yogendra Mondal Bhimta.Same as Chittagong Hill Tracts of East Bengal.Chakma Buddhists lost their homeland for their foolishness.Rajputs and Hindu Bheels of Tharparkar and Amarkot of Eastern Sindh not fought for merger of their homeland and lost those hindu Areas of Sindh.Sindhi Hindus have now no own land.These all Were connected with Indian Border.Now say me about Rampur and Mewat? Are these areas are connected with Pakistan border? LOL. Rampur, Malabar, Mewat , Good joke were they continuous to Pakistan ? I am a Bengali and during my growing up days I talked with a lot of elders specially people of grandparents age. During regular conversion partition topic always comes up. I got to know a lot of things they don't teach you in books. For ex - Sylhet although called muslim majority was infact not a muslim majority. Present day Barak Valley in Assam consisting of Hailakandi, Karimganj, Cachar districts are Hindu majority Bengali speaking valley where Bengalis are native to land. This was part of Sylhet before. If these districts where included Sylhet was a Hindu majority and even in present day Sylhet there were 2 Hindu majority districts. One was turned Hindu minority by bringing in people from Dhaka overnight before voting and thus Hindus were not allowed to vote. Present day 3 districts are in Assam which was Hindu majority in 47 and 2 in present day sylhet, 1 is shown on this map. 5 out of 7 district was Hindu majority. It was ploy of Assam congress to give Sylhet away to make sure Assam doesn't turn Bengali majority. In this they gave away Hindu lands. 1 district of Barisal had Hindu majority. That's another incident rarely talked about. Dhaka had 65% Hindu. If done properly, whole of Sylhet, Chittagong plains and CHT, Khulna division, Faridpur division, Barisal division, part of Rangpur would've been in India along with 50,000 km2 (1/3rd) of Sindh as per population, Lahore, whole of Jammu and Kashmir would've been in India. One major fact which is quite often hidden from public is that during 71 liberation war, all of Mukti Bahini soldiers were Hindus and they teamed up with Indian army. Muslims in Bangladesh sided with Pak army just like Kashmiri muslims didn't help Kashmiri Hindus out. Mukti Bahini wanted merger of Bangladesh with India but Indira Gandhi gave it away to Mujibur Rahman and also let go 93k POW who raped 300,000 Hindu women and killed 3 million Hindu Bengalis. Muslims were untouched in 71 genocide by Pak army. All 3 million killed and 3 lakh raped where Hindu Bengalis. There is an iconic picture where Pak army checks whether Bengalis are circumcised or not before killing. Very Pathetic injustice done with Hindus of Eastern Sindh and Sylhet,Khulna Dist.Bengali Hindus and Chittagong Buddhists. I belong from a namasudra refugee family & have a keen interest to the miserable history of refugees. Till today the minority Hindu from Bangladesh are coming in India & it will continue; though it is my personal opinion. In 1947 India become Independent but the effect are present which are nothing but horrible story of Bengal partition. The politician like Jogen Mondal make life miserable of lowar cast hindu people . He know about great Calcutta killing, Noakhali riot etc but he decided to be in Pakistan at the time of Independence in 1947for his personal interest & thereafter he resigned from the ministry of Pakistan & flee from Pakistan & come in India getting behind a large hindu people in misery. 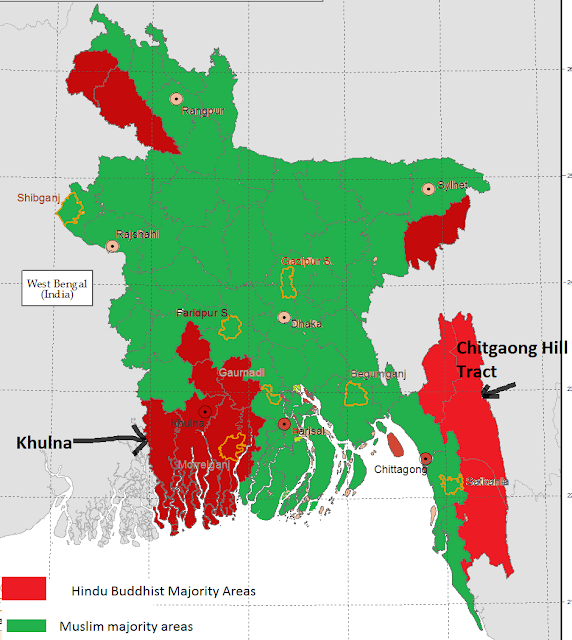 Who said Chittagong was Hindu majority? As per 1941 census Chittagong district had 70% Muslim majority.